This is my entry for Weekly Photo Challenge. You may want to check out the other entries here. …….e anche la musica, stupenda! Ah and what a perfect capture Paula! Beautiful! Great interpretation and great photo! Hey, Paula. That rainbow’s almost touching the ground. Nicely photographed. And where was it taken? Stunning photo. You were so lucky to capture it. 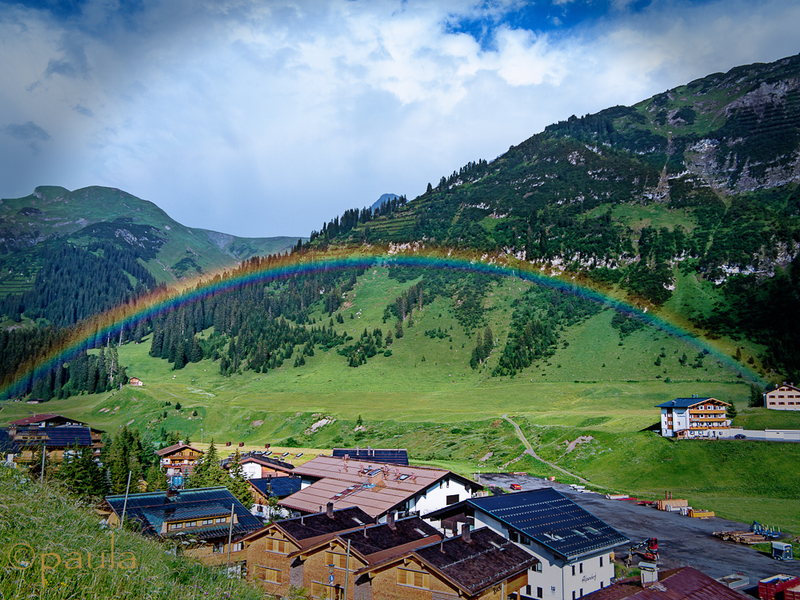 wow, what a clear rainbow – and did you look at the rainbow`s end for a pot full of gold? A great sign from above, indeed. Hello Klausbernd 🙂 Yes, I did.. I was chasing it and a pot of gold, but somebody beat me to it ;). Hugs and gratitude, P.
Very nicely captured Paula. I have a couple of rainbow shots, but only one that’s good: I had to turn the photo into a panorama to make it fit the picture. It was a tiny nightmare to post process, because I shot handheld. Great shot, Paula, and the Blackmore’s Rainbow song selection is inspired! Really nice photo! Not often do we get such a great shot of a rainbow. You have captured the challenge so beautifully! Great captured, Paula… you’re lucky catching the rainbow. Rainbow shot of the year; you catptured both ends and everything else in vivid colour. ternos y mágicos…Así son los signos que nos llegan de los dioses…Beautiful pic Paula!!!! Definitely, a lucky one 🙂 Thank you. What a great photo for this challenge! Have a great day! I absolutely love your blog. To tell you how much I enjoy it I have nominated you for the Very Inspiring Blog Award. You take amazing photos. This is very kind of you Sonika. I appreciate your reading my no to awards page, and I am flattered that you have wanted to include me :). Thank you for understanding. This is so lovely, Paula. One of the best rainbow pics I’ve ever seen. 🙂 Nice song too. It looks like a magical bridge across the valley, a stunning shot and so well captured and framed!